When I was young our home was filled with great music, and I am CERTAIN this fostered my love of music today. It is my hope that you will nurture this love of music in your own children through using the resources in this Ultimate Guide to Composer Study. This guide can in no way list EVERY resource available for composer study. I have, however, tried to include as much as possible to make this post a COMPREHENSIVE GUIDE TO STUDYING GREAT COMPOSERS. * Please be sure after you read the post to enter for the 4 CD set giveaway from Maestro Classics! These are a wonderful addition to your music library. This year we are focusing on one composer each month. Also, if we are studying a particular country we will touch on a few famous composers from that place. I use a combination of worksheets, notebooking pages, living books, and quiet listening to reinforce the knowledge of our composer. 1. Find a good living book about the composer; my children love stories about composers. We have been doing something called SQUILT (Super Quiet UnInterrupted Listening Time) since I started homeschooling. I HIGHLY recommend this as a start! It gets your children used to listening and builds the habit of attention they need for great music. 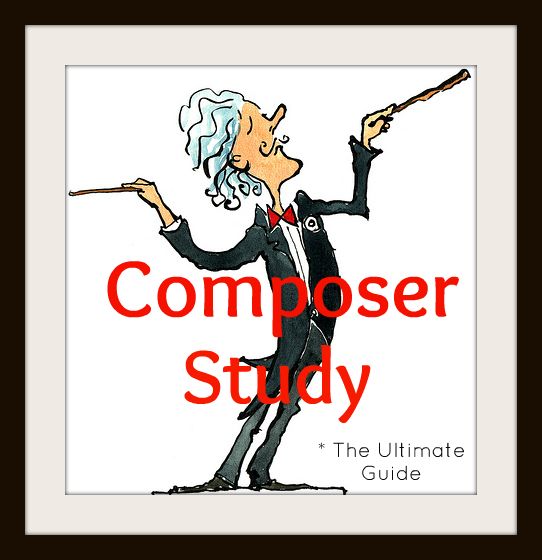 Please enjoy the links I've provided in this Ultimate Guide to Composer Study! As you can see, there are a wealth of resources -- free, for purchase and download, and otherwise! There is NO EXCUSE not to add composer study into your homeschool! How should you study composers with your children? Following are some links to help you get started. They include "how to" posts and also full units on composers. SQUIDOO offers many composers resources... see this Bach composer study - and see the sidebar at that link for related composer studies. Whether you purchase CDs or .mp3 files, here are some collections of quality music. You may also want to listen to streaming internet radio or purchase a subscription to a music service. There are so many ways to listen to great music. Spotify USA - the Netflix of music... pay for a subscription and listen to ANY music you choose. Songza - a relatively new app and online streaming music player -- FREE -- my FAVORITE! *It would be impossible to list EVERY book about a composer... please be aware there are literally hundreds of storybooks about composers. Try to add stories of the composers to your library and enrich your children's exposure at every opportunity. There are several composer curriculums available for purchase and/or download. Sometimes it's just nice to have it all done for you! Search "Composers" at Currclick - WOW! Coloring or drawing while listening to music is something we do A LOT. When I was a public school music teacher I would roll out a huge piece of butcher paper and let the kids have turns coming to it and drawing what they were hearing. It was always a magical time. Here are some resources (books and printables) for coloring, etc... while listening. Hey Kids! Meet The Composers @ Making Music Fun! Notebooking and Lapbooking about a composer make my children's learning more memorable. I always search Squidoo, Homeschool Share, and HS Launch. Following are many other resources --- by no means could I list EVERYTHING! Free Homeschool Biographical Notebooking Pages (@ Homeschool Helper) -- scroll down to "Musicians"
LOTS of pages at HS Launch - you must search "notebooking pages" and "musician"
These final resources don't fit into a particular category. They are, however, helpful when studying composers. Many are computer games and apps - good for when you need time fillers or are sitting at that doctor's appointment! Some are video series and online instructions. Composer of the Day - iPhone app developed at Wittenberg Univ. - LOVE THIS! Keeping Score! - a video series on PBS -- wonderful, full length episodes about composers. Composer Busts -- get the bust for the musician you are currently studying!